Sha’ar Zahav’s “Homemade” Passover seder is back for its fourteenth year! 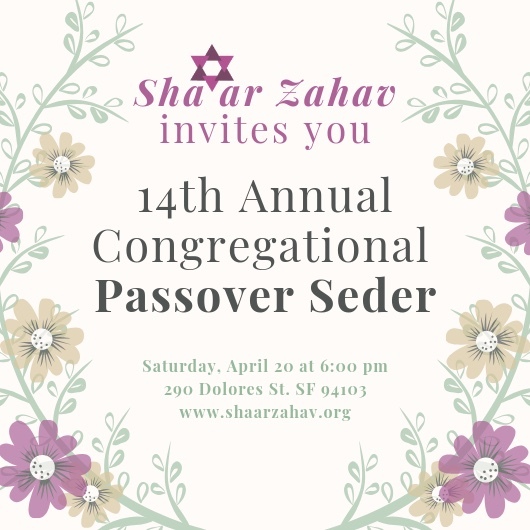 Celebrate Pesach with our community at our Congregational Seder. Bring your family, friends and a Kosher for Passover side dish (enough for 6-8 people). We will provide a roast salmon entrée. Advance registration required and space is limited. Check your various products to see if there is a fragrance free version available and/or try to use them at least a couple of hours before coming to Sha’ar Zahav to give time for the fragrance to wear off. Switch to fragrance-free laundry detergent and softener (it works just as well and is the same price!